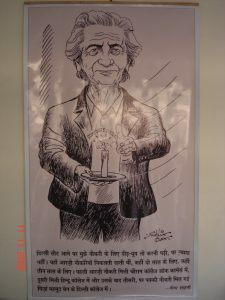 The 4th Bhisham Sahni book fair was held at Zakir Husain Delhi College, University of Delhi on 10th and 11th March, 2016. The book fair was inaugurated by well known theatre actor Mr. M.K. Raina and distinguished poet Sukrita Paul Kumar was the guest of honour. On the inaugural day the Arts and Culture society of the college performed the play Chief kidawat based on a short story penned by Bhisham Shani. Day two of the book fair was marked by Dastangoi, story reading and screening of the iconic film Tamas-based on Bhisham Sahni’s hard hitting novel. Book exhibition and sale continued on both days between 10 am and 4.30 pm. To nurture a passion for reading in the student community, Zakir Husain Delhi College is organising Third Bhisham Sahni Memorial Book Fair on the 25th and 26th of September 2013, honouring the eminent author, playwright and activist and Padma Bhushan recipient Late Shri. Bhisham Sahni, who taught at the college’s Department of English. The fair was inaugurated today by eminent writer in Hindi Maitreyi Pushpa. On this occasion the famous play “Kabira Khada Bazaar Main” written by Bhisham Sahni was staged in the College auditorium. The play was directed by Surendra Sharma, a well known theater actor and director from NSD. The play is a powerful drama that depicts the character and vision of Sant Kabir Das, a mystic poet and social reformer of the 16th century. It presents the religious orthodoxy, superstitions and state of oppression during Kabir’s time and his fearlessness and truth seeking temperament. 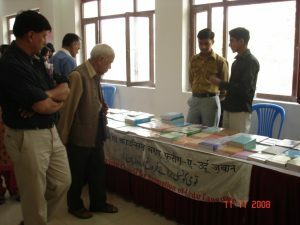 Various publishers of books in English, Hindi, Bengali, Urdu and Persian like Sahitya Akademi, National Book Trust, Rajkamal, Tulika, Idara-i-Adabyat-i-Delhi,; and popular academic publishers such as Oxford, Cambridge, Pearson and many more are a part of this fair and offer discounts for the students and teaching fraternity. On this occasion Indian Council of Historical Research and Hindi Madhyam Karyanvayan Nideshalaya, Delhi University have also displayed their publications. As a part of this event, film based on Bhisham Sahni’s famous novel Tamas was screened in the College Auditorium.